Harry Potter fans are in luck. Today we talk about Quidcraft Quidditch 1.7.2 and 1.7.10 which is in its versions. 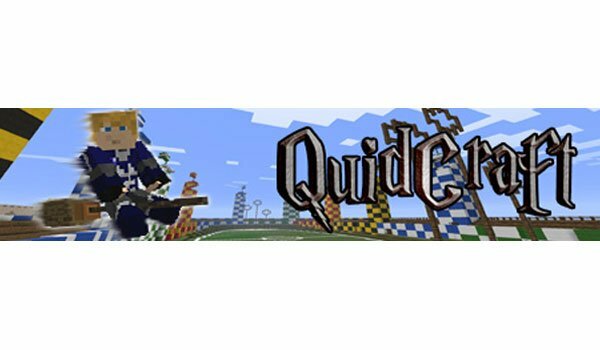 This is a mod that allows users to play Quidditch in Minecraft. For those who are not really fans of the series or just memory fails, it’s a game in which the players are mounted on broomsticks and the object is to get the ball into the hoops that are in the field . Quaffle: When we put this ball in the hoop, get 10 points. Bludger: When throwing this ball, impact and bring down the nearest player. Golden Snitch: When we put this ball in the hoop are obtained 150 points and finished the game. The Quidditch Quidcraft mod can be really fun in multiplayer servers. How to install Quidcraft Quidditch Mod for Minecraft 1.7.2 and 1.7.10? Paste the mod downloaded file inside .minecraft / mods folder. Run Minecraft and enjoy Harry Potter’s favourite game! Why do you need both versions of the mod? My C and Ctrl keys have no elevating effect on the broomstick, nor does the V key have any effect. WASD keys do function as normal. Am I doing something wrong? I’m using the 1.7.10 mod. Help. I can’t seem to get the broomstick ascend/descend controls to work with the Quidditch mod. C, Ctrl, or V keys have no effect (the normal WASD keys do work, however). Further I don’t see broomstick up/down controls listed on the Controls page, but I do have the broomstick in the inventory. It moves around with wasd but won’t go up or down with C, Ctrl, or V. Am I missing something? how do you add it i have downloaded it but i dont know how to use it please HELP!